From the beginning, Knauf liked this property because of its very private cul- de-sac location that was ideal for luscious landscaping. Working with the design team was a perfect collaboration from start to finish. “As a designer, it was a dream to be able to choose whatever we wanted, without limitations, in order to create a unique and appealing home for our clients,” Johansson says. ABOVE: In the lanai, a sectional and woven lounge chairs in neutral outdoor fabrics from Lloyd Flanders, and a cocktail table from Global Views created with hammered nickel, form the perfect vignette for socializing or lounging. COVER PHOTO TOP: The aqua-blue color in the shimmering pool, the green tropical landscape and light shellstone blend perfectly together to create a refined coastal feel. An outdoor kitchen with a dining area is ideal for entertaining guests. New owners Marina and Ric Dillon fell instantly in love with the home’s sophisticated coastal look, lush garden views through large windows, and the expansive outdoor living space that was ideal for their dogs to run around. 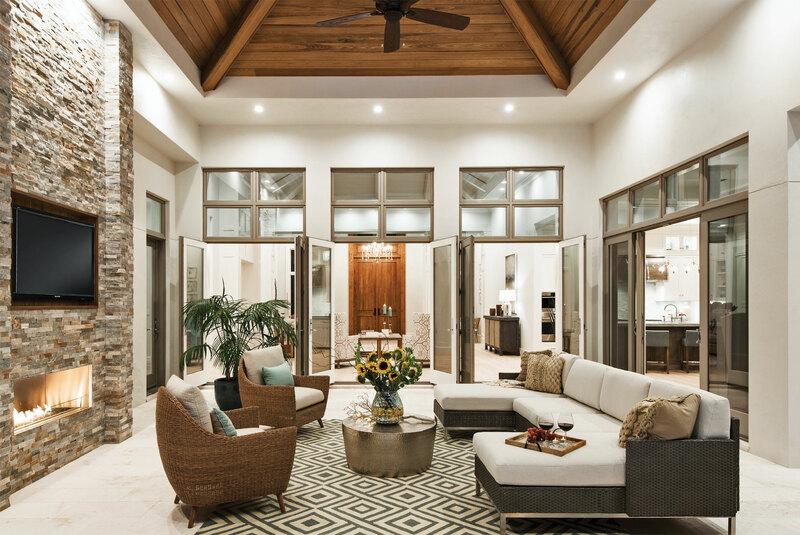 “We loved Calusa Bay Design’s work in other homes, so when we saw the design for this home we were very happy,” Marina says. The design of the home embodies elegant yet casual indoor-outdoor living with a neutral color palette, and pops of light blue and aqua hues, chosen to convey a coastal feel. Light-colored Legno Bastone wide-plank oak flooring and walls in a soothing pale blue- gray, enhance the beautiful colors and textures of the furnishings. 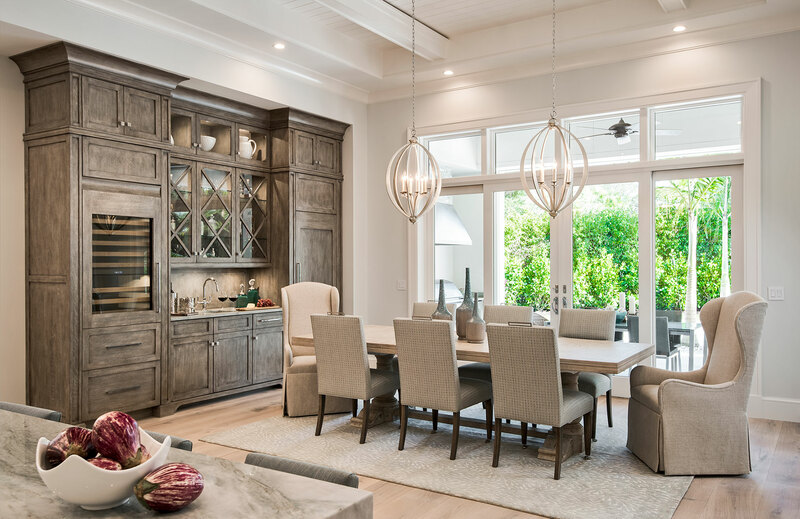 ABOVE: In the dining room, a custom, trestle base dining table in an ivory finish and linen-covered host chairs from century furniture exude casual elegance beneath a pair of curry & co.’s chandeliers finished in silver leaf. The lanai offers stunning views of the landscaped pool and is warmed by a stained cypress tongue-and-groove ceiling. The soaring 14-foot stone fireplace is the focal point of the space that features a custom outdoor sectional and woven armchairs from Calusa Bay Design, perfect for lounging. “This amazing outdoor living space is what makes this home so unique,” Johansson says. Behind French doors, the living room shines with a shell and crystal chandelier, a pair of leather chesterfield sofas and a pair of custom wingback chairs. The dining room is a bright open space with a view of the tropical oasis through sliding glass doors. Unique chandeliers from Currey & Co. cast a soft glow over a custom trestle dining table in an ivory finish. It is lined with side chairs upholstered in a textured blue hue and flanked with linen skirted, winged host chairs. A wall of custom oak cabinetry is stained to resemble driftwood and echoes the home’s coastal theme. 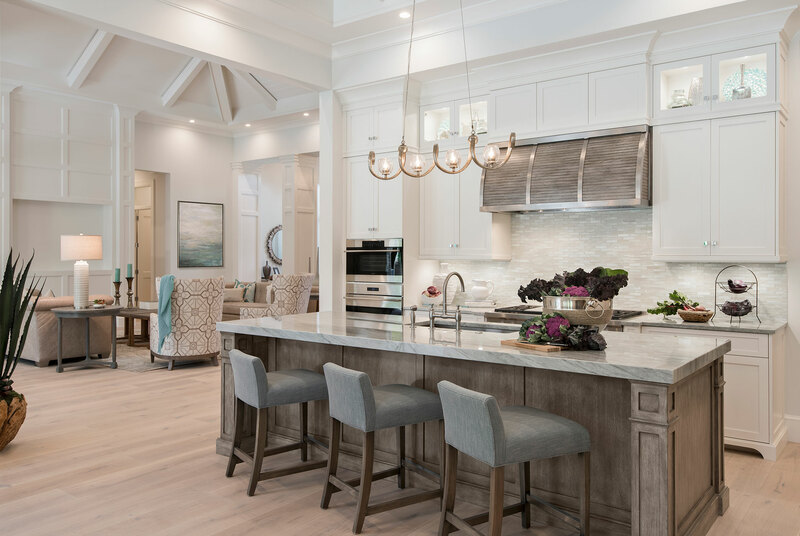 ABOVE: A favorite gathering place for the family, the kitchen features white cabinetry from Ruffino Cabinetry and countertops topped with sea pearl quartz. An expanse of light, Legno Bastone wide plank flooring flows throughout the home. Just a step away is the brightly lit kitchen with custom white cabinetry exquisitely crafted by Ruffino Cabinetry. A breakfast island created with a sea pearl quartzite countertop is outfitted with counter stools upholstered in a spa-blue fabric that tuck neatly underneath. The room’s look is completed by a whimsical chandelier in a silver leaf finish that becomes the focal point above the kitchen island. ABOVE: The light-filled master bath exudes coastal appeal. the kohler freestanding tub is artfully relaxing, and his-and-hers dual showerheads create a spa-like retreat. White marble flooring grounds the space. The spacious master bath features views of the private gardens through 10-foot-tall windows and is centered by a white, free-standing cast iron tub in a geometric shape. The luxurious shower is designed with glass walls and his-and-hers showerheads. “With lots of light bringing the outside in, this is another wonderful space,” Knauf says. ABOVE: A large Curry & Co. chandelier shines on the serene master bedroom created with soft colors and neutral tones. At the foot of Bernhardt Interior’s four-poster bed is an upholstered bench with a wood finish from Dovetail Furniture. Atop a taupe chaise sits Maggie, Sherman’s adorable Cavalier King Charles Spaniel. The tranquil master suite is bathed in natural light by large floor-to-ceiling windows to take advantage of the gorgeous outdoor scene. The four-poster bed is wrapped in luxurious soft colored bedding with a calming touch of blue and is accompanied by beautiful two-tone bedside chests. “Everything is coordinated, there is no mix and match,” the builder says. A hand-knotted, stone- colored area rug grounds the space in comfort. 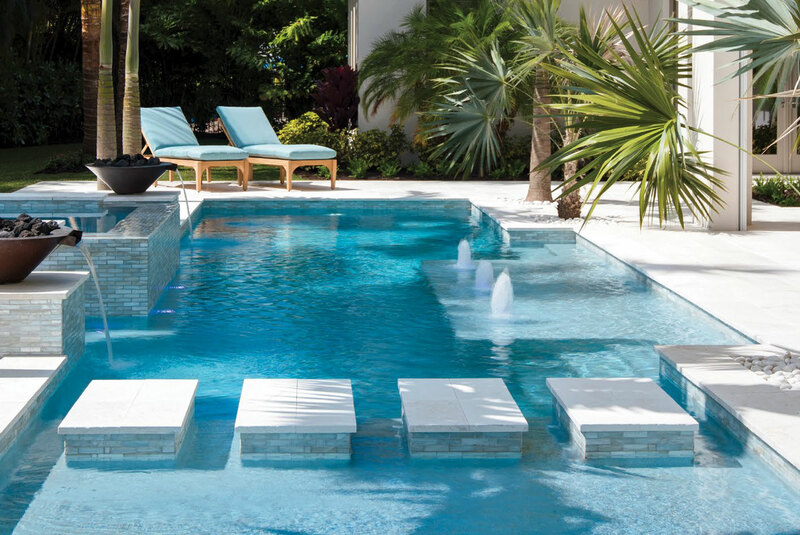 ABOVE: In the pool area, Summer Classics teak chaise lounges cushioned in aqua, have surprise side drawers to hold beverages. “We really wanted a spacious outdoor area where we could enjoy the best of Naples living,” homeowner Marina Dillon says.